Cloud Computing, IoT, Big Data, Machine Learning, AI, VR...In the past ten years, we have seen a number of cutting-edge digital advances emerging and being fully integrated in our every day lives. Data-enabled technologies have become true value-creators, constantly reshaping our socio-economic activities, transforming the way we interact and blurring the lines between the digital and physical worlds. As these technologies are becoming ubiquitous, collaboration across sectors and borders has proven essential in order to realise their potential and to protect against the risks and unintended consequences linked to digitisation. 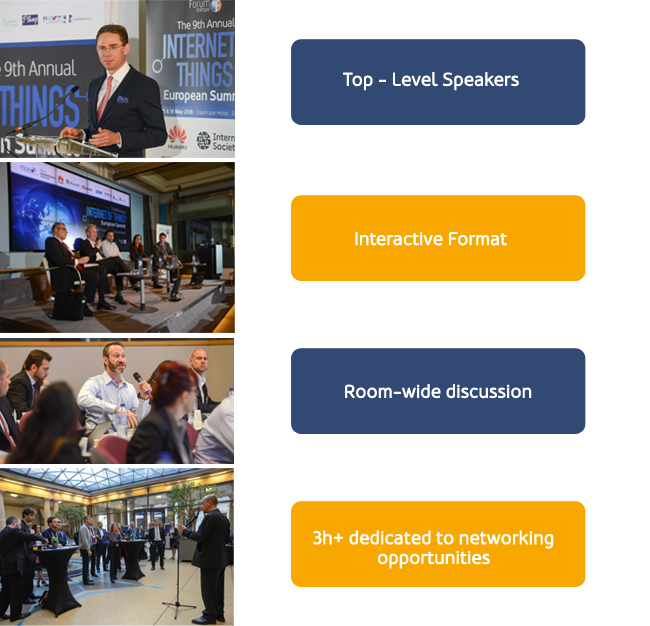 For the last nine years, The European Internet of Things Summit has provided a key annual meeting to discuss issues relating to digital innovation in smart environments. We have now reached a turning point where it is impossible to talk about IoT without bringing in the many interlinking technologies that also underpin the emerging digital societies of tomorrow. The Future of Internet Conference will provide a broader platform that allowing us to continue the focus on IoT, while bringing equally exciting discussions on issues such as 5G, big data, cloud computing, AI, VR and much, much more. For information on speaking, sponsorship or visibility opportunities, and to discuss how you can maximise the value of your involvement at the event, please contact Anne-Lise Simon on anne-lise.simon@forum-europe.com or on +44 (0) 2920 783 023.